It's high time I did a little celebrating around here. A Month of Sundays came out this summer and I've barely had a moment to register that it is in the world. 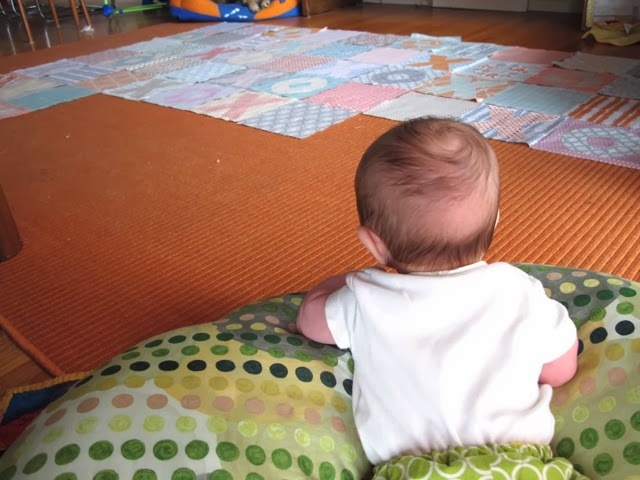 Something about those real babies taking up all my time, and a certain charity project. But this monh I'm going to celebrate. You'll get some behind the scenes goods, quilts in progress, good food, and even some giveaways along the way. I hope you'll join me and share in the party. I'm going to kick things off with a little background on the book. 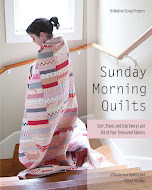 A Month of Sundays started even before Sunday Morning Quilts came out! My publisher, Stash Books, called us after the photoshoot for Sunday Morning Quilts with nothing but nice things to say. Then we started talking about the quilt Sunday Morning itself. The low volume scraps were really admired and I blurted out, "I bet I could write a whole book about low-volume quilts and we could call it A Month of Sundays." Their response was to request the proposal. So, before my first book was even in print I was working on the second. Oh, and right when we were negotiating the contract I found out I was pregnant. After three miscarriages I was slow in accepting and appreciating that pregnancy, but everything aligned and I was set to deliver a baby and a book around the same time. Needless to say, I negotiated some later dates for the book because the baby sure wasn't going to wait. Now, for me, it feels like I gave birth to twins, the book and my son are so intertwined. So as my tummy grew I wrote away. Thankfully, I am not the type of writer that needs her space to be just so and free from noise and distractions before a single word escapes my brain. I wouldn't even get this blog written if that is the case! No, my brain is constantly churning through sentences and hopefully there is an opportunity to get them down near by. To write this book I sat in the dark in my dining room a lot of the time. Wrapped in a quilt, a pot of tea by my side. I was in the dark because if I turned on a light it usually woke the girls and then I got no work done. So, if I need glasses in a few years, I will blame this book for it and not encroaching middle age at all. I also wrote a fair amount of the book in the IKEA cafeteria. While The Monster was in school (she was in KG that year) and if The Evil Genius didn't have preschool we would hit IKEA to take advantage of the free babysitting/Smaland. I would get an hour to bang out some text. I can write a lot in a hour when that's all I get. Then there were the times I edited during swimming lessons or got up extra early to hide in a local coffee shop as the final draft was due so that I wasn't interrupted by more requests for cinnamon toast. The writing in this book is intensely personal for me. Each essay for each section - Eat, Relax, Shop, Explore - is a true story, a reflection of my life and outlook. 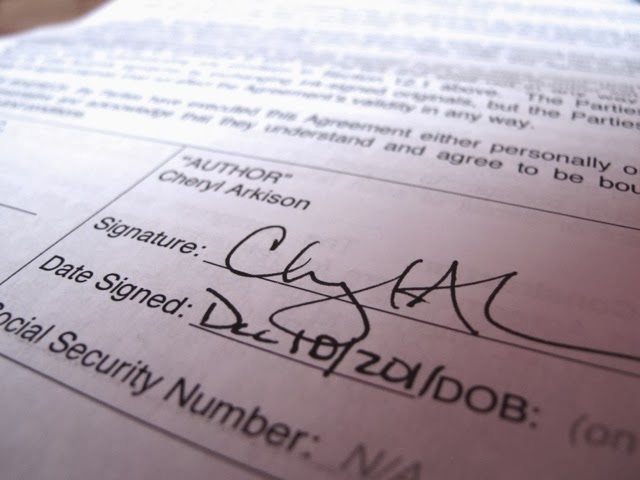 Funny thing, it wasn't until I was out with my red pen on the very last version of the book before it went to print (they call that version Pages) that I realized I'd written one big love letter to my husband. So, if you like romance, even the unconventional ones, this might be the book for you. The little tidbits are also part of our life. Lessons learned, activities that are a part of us, or treasured moments - they can all add to your life too. And they are all about taking the time to enjoy the time, to slow down. Then there are the quilts and sewing projects. I will talk more about them over the next few Sundays, but I did want to say now how excited they still make me. I look at them now, or wrap myself in them, or use them for my shopping and smile. You can't get tired of these low volume fabrics. Well, at least I can't. The other thing that makes this book truly great - in my eyes - is the photography. Initially I was asked to do my own photography. I'm okay, but not great at making pictures. And I knew what I wanted. I could envision the styling on nearly every project as I made it. I knew the locations and props for nearly every shot before the quilts were done. But I needed a photographer to get into my brain and take the photos for me. Enter Kate Inglis. We worked together over a very intense 5 days to take all the styled, atmosphere, and lifestyle shots in the book. I carted around my son so that he could be nursed because he was only two months old at the time. My vanity reigned as we built shots around not showing much of my two months post partum body. And everywhere we went Kate found the light. I hope Kate will shoot every one of any of my next books. 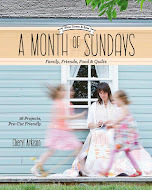 So, this Sunday, I am raising my cup of tea and reminiscing about the process of creating A Month of Sundays. It's a snowy, blustery day here. Perfect for hiding inside and appreciating the moments I have with both my family and my stash. And yes, I am curled up in a quilt. Join me for the next month of Sundays. Here is the schedule for what I'll be sharing here. November 10 - Just Where Do I Get My Ideas? Yes, there will be some giveaways. Books, fabric, and maybe a few extra treats. To be entered in the giveaway you simply have to leave a comment on any post for this A Month of Sunday series. Ask me a question, tell me how you are enjoying the book, or respond to the weekly query I post. One comment per posting, please. At the end of the series all name will get submitted and I will draw for the giveaways. International entries welcome. So, what are you doing this Sunday? I am looking at quilt blogs and quilts for inspiration as I debate whether or not it is time to get up and on with the day or to have another cup of tea while sitting in my bed under two quilts. Your post popped up in my reader and so I came here. I am looking forward to hearing more about the book, I have read it and love it. Congratulations on another book! I can't wait to seek it out and spend some time looking through it. Today I'm off to pick up my son and his fiancee. We are going to meet her mother and tour a possible wedding venue and then go out for tea. Should be a fun day! It is nice to see a great book by a CANADIAN quilt author!!! Good for you! A celebration is certainly in order :) we driving out to grandma's to grout her kitchen - we spent a Sunday at the beginning of September laying the tile. A big job made a lot more fun with family! I ordered/received both Sunday books just last week and have already spent several couch times reading and enjoying the photos. From your blog, I've organized scraps and have made 12 slabs. So, you're definitely an inspiration! Keep up the blogging. This book is on my list for Santa to bring this year. I am so looking forward to it - and I love that it is "text" heavy - those are the kinds of quilt books I read over and over again! 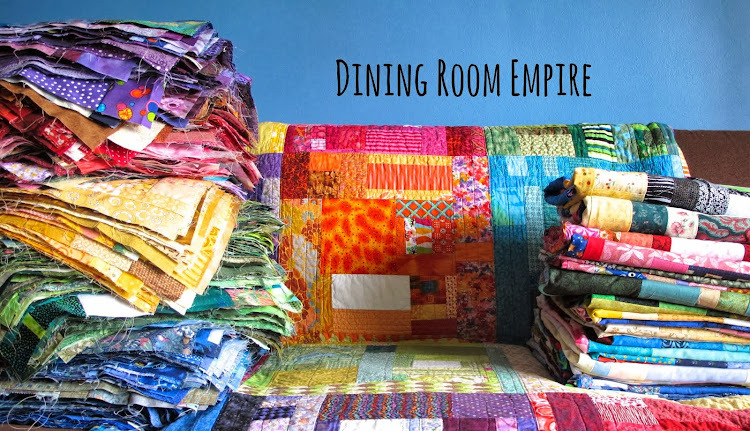 This Sunday, I am preparing projects for my guild retreat next weekend, starting the quilting on a very special quilt and making Sunday dinner for my family! I love Sundays. I love your book. It's nice to have a quilting book that isn't just patterns, but little stories or essays to read along. Kind of like a quilting magazine that I yearn for. Today, we're going in the hot tub and maybe a movie. I will send the kids to shovel the driveway too. And quilt. I am not a fan of Sundays - I get restless and need to get out and about by Sunday...and then Monday comes along so quickly. Your quilts are beautiful. 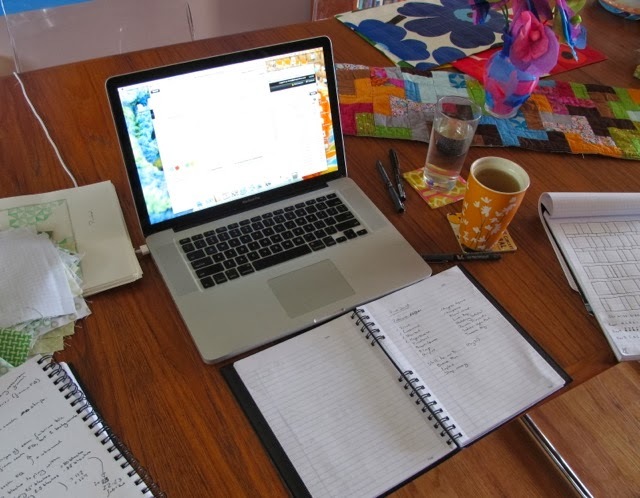 I look forward to reading more about your process for writing your book. I am in awe of how much you manage to accomplish with all you have going on in your life! I have a TO DO LIST that will take me several lifetimes to complete. Guess I need to stop making lists and start DOING. I just finished a slab quilt that was inspired by your blog. Thank you for getting me motivated. My daughter has been enjoying your book and has been buying low volume fabric. That is the next quilt she plans on making. I have not had much of a chance to read the book. She keeps it near and looks at it often. I only get to steal peaks when I am at her house. What I have seen I have enjoyed also. Loved todays insight into how it came together. It will add to my enjoyment of seeing the book. Looks like I need my own copy. I have enjoyed reading a month of Sundays, but have yet to decide which project to start first! Today I am heading back into my sewing room after being away for a week. I am doing what I call 'elf sewing'. I am making a few lap quilts and will let my grown sons choose which they like for Christmas. I purchased the book for your writing more than for the quilts. I haven't read it all yet, but I'm enjoying it. I like the first book too and may make a quilt or two from it. What a lovely post. I am looking forward to reading your book. This Sunday I am putting away Halloween and then thinking about Thanksgiving, and of course Christmas sewing. I woke up this morning to the first snow falling. It always makes me happy. I'll be doing a little sewing I hope between laundry and a few errands to be ready for the work week. Thanks for sharing your process in writing the book. I look forward to learning more. I'm messing around on the computer when I should be quilting my grandson's Tshirt quilt. It is a beautiful yet cold, for us, Sunday. Your son is precious, congratulations. It is a very blustery snowy Sunday here too so I am inside (our vehicle drifted in to the garage) and just finished the book I was reading. Now I think I may make some tiny 1.5" HST for the Christmas quilt that is in progress. Congratulations on another book. It does look good, Cheryl. This Sunday I have two wee grand kiddies and I have just sent them outside to find the grand Farmer while I have a sweet sip, a wee peek and a few deep breaths before I chase after them. Looks like our last Sunday before the blustery sets in. I hope the rest of your Month of Sundays are more relaxed. I am embracing low volume! I just looked on Amazon and it looks like a lovely book. Today we had a lie in as the kids were staying over at my mum's (first time this year! )and we may have had a bottle of wine and made the most of the peace! Congratulations on your new book. What I've seen so far looks lovely and I enjoyed your first book. What great fun! I wish I was sewing! But I had to do some repairs (the table i use for cutting is falling apart, oops) and cleaning! Today is a blustery Sunday, and I'm home from church, and enjoying home-made soup. Then I'll tackle the paperwork from yesterday's wonderful Quilt Show that I helped put on for my quilt guild. Feeling contented, and grateful for a successful event. What a great idea! It is funny (in a good way) how life takes twists and turns. So glad of your celebration of your book and your baby and dont for get the current "slab" project. "Here looking at you kid"! (toasting with a cup of tea). PS. I love the back of babies heads, so cute. Quilting, cycling, shopping at Famous Foods and the quilt shop ... it was a good day! I've made the cocoa nib shortbread from the book and it is awesome. I couldn't find the whole wheat flour, so I used all all-purpose and it was fine. Now I've found the whole wheat flour, so next time I'lll follow the recipe exactly ... Thank you! I have enjoyed hand sewing binding while watching movies in bed with my sweet husband! After church we ate lunch at the restaurant that we just finished building. It was great to see how busy they were on their third day after the grand opening. What a blessing for the owners. We are a commercial contracting company and this project became very personal as we developed a friendship with the owners during the build. I had a delightful outing with my 12 year old to see/hear Lemony Snicket/Daniel Handler. I do so love to read your blog posts and often think about what a lovely writer you are. I love hearing the backstory behind the book. How smart of you to take advantage of your resources (like IKEA) to get it done. My Sunday afternoon was spent at a local fundraiser for a music endowment fund in honor of a little boy who had cancer. It was an amazingly uplifting event that brought so many people together so joyfully. Really interesting to hear the path way you took to the completion of this book, well done your obviously an excellant time juggler as well as a nifty crafter! Wishing you every possible success with this new book! Congrats on your two books and your son! :-)(as well as your daughters) To say you must have been busy is probably an understatment. You say it is snowing outside. I am from Ontario and we just got our first big frost last night. All the leaves on the ground were glistening this morning. Not looking forward to the white stuff :-(. Have fun on your quilting journey!! I really enjoyed the first book and this one sounds even better. Really don't know how you did it. It's nice to have a little insight into the whole process though. Thanks for sharing. Sunday morning - sitting in the sun with my coffee and my computer - drooling over the amazing quilts I see and fantasizing that one day that could be me. I sewed a bit and went to see some local artists work with my daughter and grandsons. I have been ogling this book since it came out. I usually get a couple of books for Christmas from my hubby, and this one is on the top of the list! My Sundays are far too busy... Chasing three little ones through the routine of church, activities (soccer, basketball, piano lessons, swimming lessons), then getting ready for the work week to come (packing lunches, filling water bottles, getting backpacks stuffed with mittens and touques and snowpants) and then finally collapsing on the couch with a cup of tea before falling asleep in front of the tv. One year soon I hope to have my lazy Sundays back! Sunday passed with a 12 by 17 inch (30 by 43 cm) Lap Loom and brightly colored yarn to match the roving I dyed coming together to be cheerful weavings that hang around my house promising spring and summer again. I love reading about your process. This past Sunday I was out raking leaves but thinking about quilting while I was doing that. Looking forward to rest of the posts. I feel horrible saying this, but I haven't had a chance to pick up a copy yet!! But it IS on my very small wish list. This post just makes me want to go buy it even more. So i'm on my way over to Amazon RIGHT NOW to get a copy. :) It sounds like just the kind of quilting book I would love. I just have to tell you that I ADORE this book---and, unknowingly, did read it straight through, then went back later, laughing, to see what the projects were. You did a fabulous job. looking forward to more from this book! Thank you! When I was pregnant with my third child last year I thought to myself, "How will I ever sew again with 3 kiddos on the loose?" I then decided maybe I should live vicariously through other quilters. 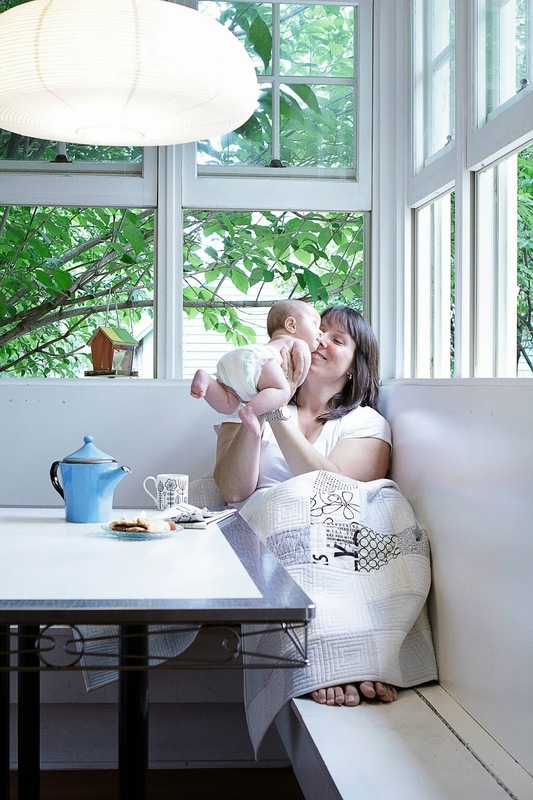 I searched the web for "quilting and mothering," and up came your blog. 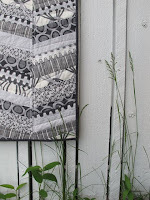 I have never followed a blog before, but found myself quilting more than ever before. Thank you! Congratulations on your new book....and new baby!! I am certainly enjoying your first book. I am a little behind in reading blogs, we have been travelling...so just catching up now! I'm finishing up projects and organizing my fabric stash. Okay, so maybe those projects will just take a bit longer to be finished. Love your first book and am looking forward to this as well! This Sunday, as every Sunday, I will be quilting. I can't wait to see your book and reading about what inspired you.